31 the invitation, and promised to meet with Mrs. Cook next time. (providing they found her at home). 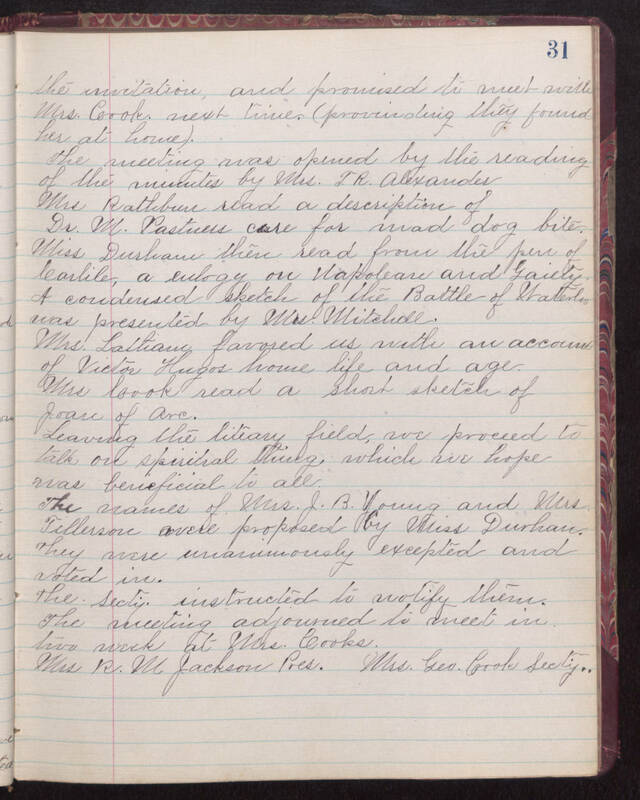 The meeting was opened by the reading of the minutes by Mrs. J. R. Alexander Mrs Rathbun read a description of Dr. M. Pastuers cure for mad dog bite. Miss Durham then read from the pen of Carlile, a eulogy on Napolean and Gaiety. A condensed sketch of the Battle of Waterloo was presented by Mrs. Mitchell. Mrs. Latham favored us with an account of Victor Hugos home life and age. Mrs Cook read a short sketch of Joan of Arc. Leaving the literary field, we proceed to talk on spiritual thing, which we hope was beneficial to all. The names of Mrs. J. B. Young and Mrs. Tillerson were proposed by Miss Durham. They were unanimously excepted and voted in. The Sect'y instructed to notify them. The meeting adjourned to meet in two weeks at Mrs. Cooks. Mrs. R. M. Jackson Pres. Mrs. Geo. Cook Sec'ty.